Complete with fan jet & oscillating nozzle. 50m of hose. 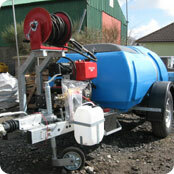 Great for cleaning tarmac/patios or anything that needs a serious power washer.